meringue skirt pt 2: finished! so this skirt has been done for a couple weeks now and i finally get to show it off! 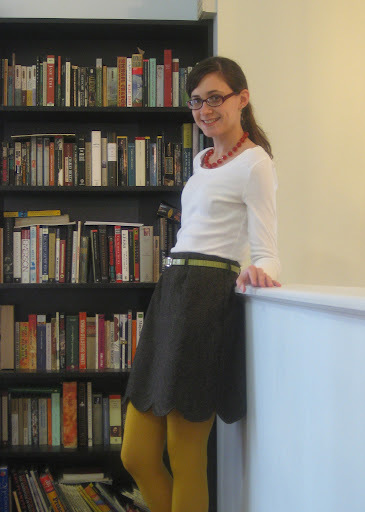 despite the fact that i’m not totally in love with the fabric color, i do love how the skirt turned out. if you’ve been following along, i made a couple changes to the pattern. first i eliminated the hem facing and fully lined the skirt instead, then i replaced the waistband facing of the pattern with my own elastic band version. this really works out great and provides a little movement. 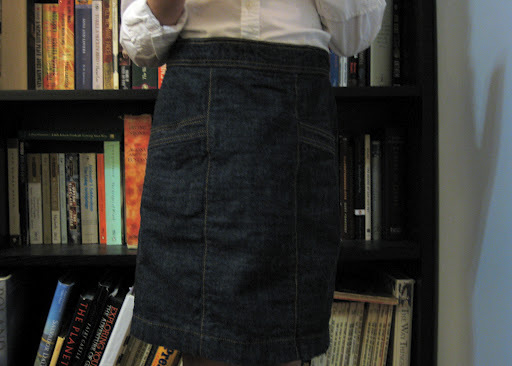 i find non-waistbanded skirts to be very hard to fit. if it’s too tight it digs in uncomfortably. too loose and there’s just no way to keep it in place. according to the size chart i was in between a size 4 and size 6. just to be on the safe side i cut a 6, but in hindsight a size 4 would have fit better. not a big deal, the elastic waistband facing still keeps everything snug and comfortable. plus, my addition of belt loops and a belt give my waist the proper definition it needs. you can see i have a bit of extra room causing minor bunching around the waist to hip area. for some reason i have it in my head that my hips are super wide. hmm… maybe they’re not. i could probably add an inch or two in length. i have a freakishly mis-proportioned dimensions. even though this skirt isn’t something i would ordinarily want more than one of, it is so cute i just might have to make a more summery version as well! i love the classic shape, the unique hem detail and (done my way…) the total comfort! plus, it’s a fast, instant-gratification project. and who doesn’t love that? meringue skirt pt. 1: you call this grey? i’m very excited about the two colette pattern pieces i’m working on! 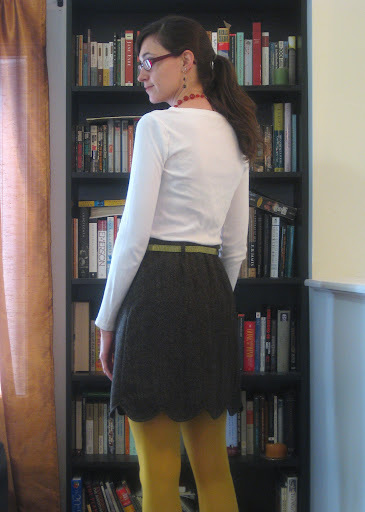 first up: the meringue skirt. i guess my brain went straight to grey and overlooked the fact that indeed the online picture does look brown… sigh. it’s not that i have a problem with brown. brown is perfectly fine, i just thought black/white grey would transition me into spring a little better and not scream “autum!” okay, i’ll live. 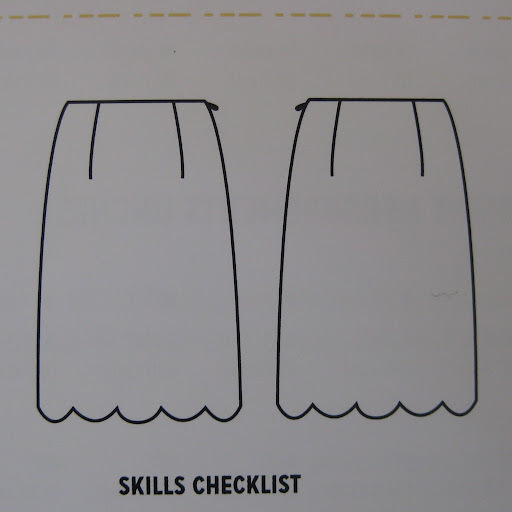 for this skirt i digressed from the instructions just a little. first i feel like i need some sort of waist definition. usually i’d just modify a pattern and add a waistband, but i decided instead to just add belt loops so i could belt it. it worked out great, though can i just tell you how much i HATE making and sewing on beltloops? it ranks very high on my list of things that i do not enjoy doing. fortunately, in this case it was well worth the effort, because they turned out perfectly. whew! 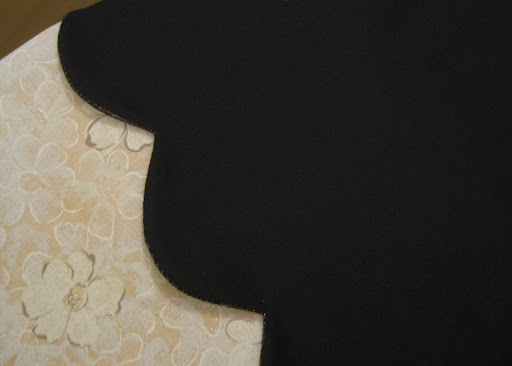 another change i made was fully lining the skirt instead of using the scalloped facing. two reasons: one—this is wool, wool is itchy for me. 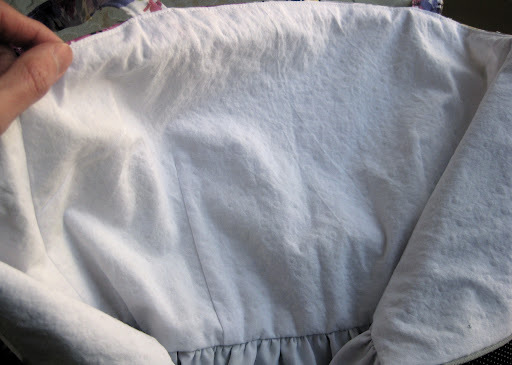 two—i really don’t like doing a blind hem. 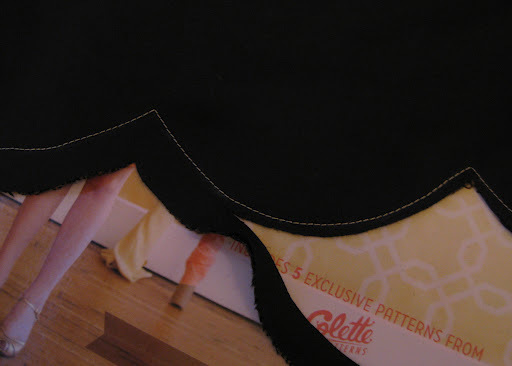 not out of laziness or anything, but i don’t like seeing the distortions from a mediocre blind hem job. it can cause the skirt to hang funny and i just wanted to avoid that. plus, adding a lining was very easy to do! i simply cut my lining identical to my wool. i did take the time to chalk out my stitching line which made this so much easier! 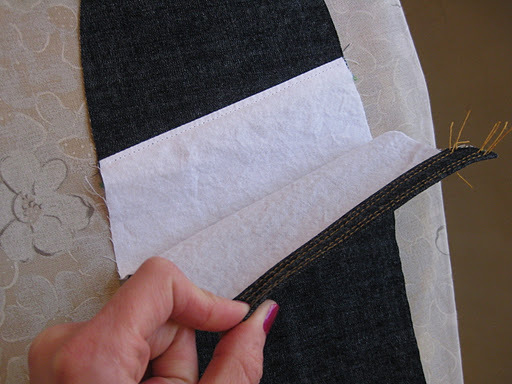 i stitched the hem with the wool and lining together, then trimmed the seam allowance and pulled the lining to the inside and pressed the edge. 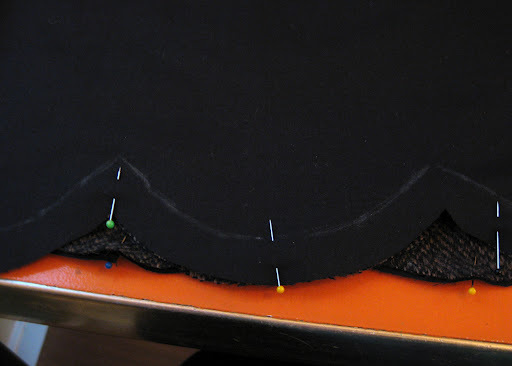 on a side note, i highly recommend trimming the seam allowance very narrowly and notching in between the scallops only rather than notching the entire edge of the curve. since most of the curve is along the bias of the material, it will easily press into place. notching around the curve tends to give a lumpier edge. okay, so to further make sure the scallop edge is perfect, i top stitched the entire hem, which sounds much more tedious than it actually was. i simply followed the edge of my pressor foot and traded out my regular thread for a heavier topstitching thread so it shows up better. 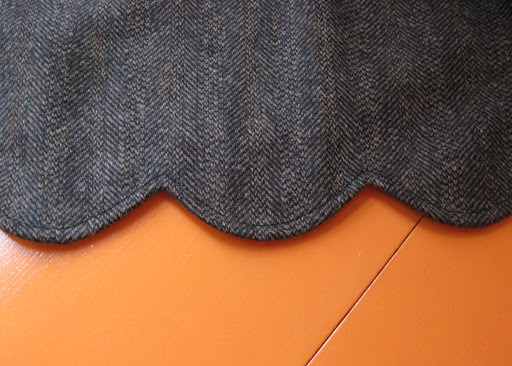 it keeps the lining from trying to peek out the bottom and gives nice definition to the scallop. i also basted the skirt fabric and lining together at the waist just to keep them from shifting around as i finished the waist. 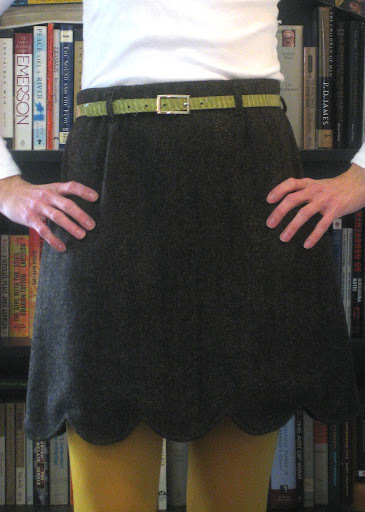 the other change i made to the pattern was swapping out the waistband facing for some of that fat belting elastic. now, this was pure genius on my part, if i do say so myself. 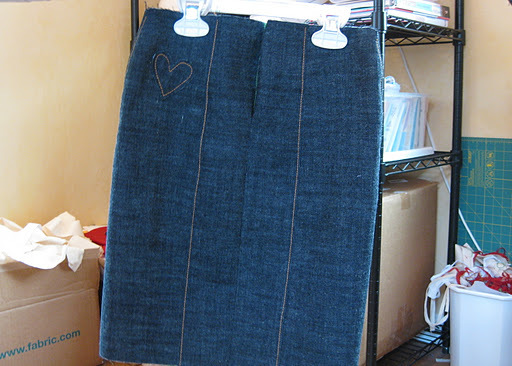 i cut the skirt a sz 6 because i was kind of in between the 4 and 6. but, to make sure i got a snug fit, i cut a piece of elastic about 1/2″ smaller than my actual waist. 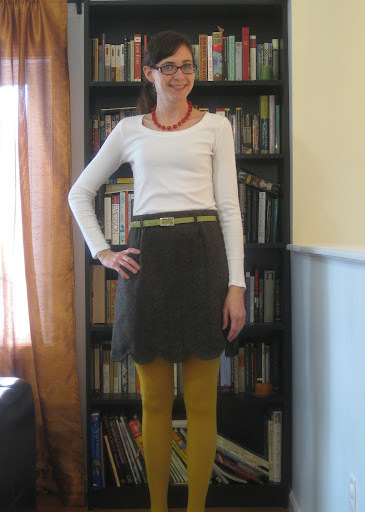 i pinned the elastic to the skirt, evenly distributing it. 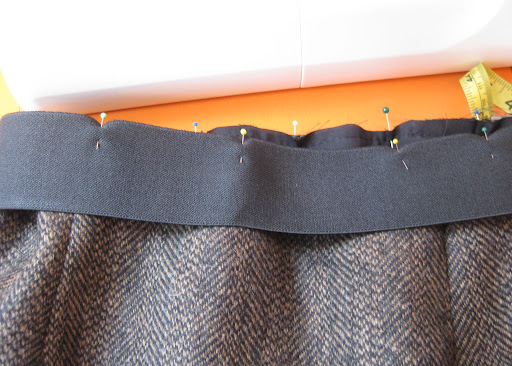 then using a zig-zag stitch i stitched the elastic to the top of the skirt. then i turned the elastic to the inside and hand stitched the elastic edge to the zip. 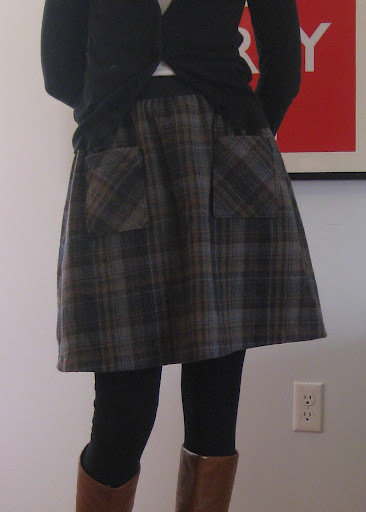 then i stitched in the ditch at the right side seam through both the skirt fabric and the elastic. wool (i have read) tends to stretch out as it’s worn, so the elastic makes sure this doesn’t happen! i love this elastic thing because it keeps the skirt comfortable and the elastic undetectable from the outside when you wear it. how nifty is that? 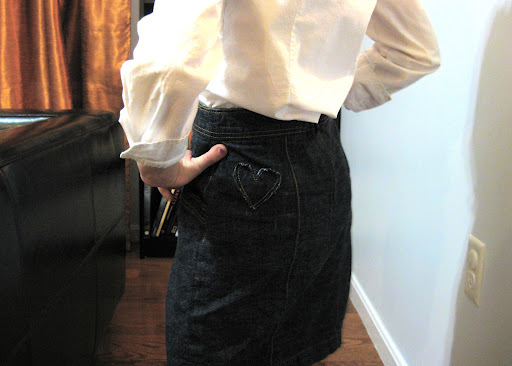 this is perfect for any non-waistbanded skirt. seriously, i hope you try this!!! okay, so that’s it for the construction… pics of me wearing it to come! 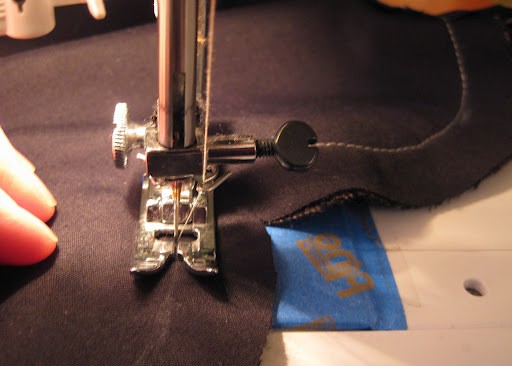 usually i stick to one project at a time from buying fabric to sewing the last stitch. not so much right now… so i just wanted to share with you everything i have been working on! at christmas i received the colette patterns handbook, which i totally love. the illustrations are beautiful and the content is very thoughtful and really makes you stop to think about your sewing choices. 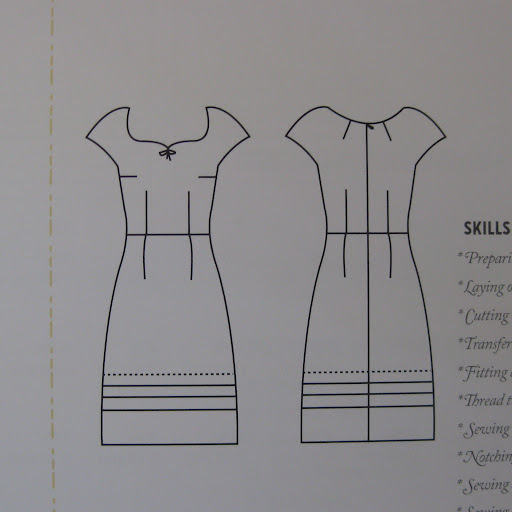 the book includes five patterns and i’m working on the first two for now: the meringue skirt and the pastille dress. they are both relatively simple pieces with lovely little details. the skirt has a scalloped hem and the dress has a cute neckline, cap sleeves and tucks at the bottom of the skirt. both are very practical and will fit into my wardrobe perfectly! sometimes you just have to know when to let go of your original plan and make a change. hmm… sounds like more than just sewing advice. i do plan to revisit the pattern this summer, it was supper fast and would be a great floaty summer dress or swim suit cover-up! hahaha… like i can even think of summer when it’s 30º F outside! then i reworked a dress i made last year for one of my sisters. i’ve learned so much about dress construction and fitting since then—i took apart practically every seam, underlined the bodice pieces, changed out the lining and cut the bodice differently. in the end it was a ton of work but totally worth it. i’d rather put extra work into something and have it get worn instead of hanging squished and unused in the back of someone’s closet. lucky for me, my sister and i are basically the same size from shoulder to waist (though i’m at least 4″ taller…) so i can show off the finished product! it’s seriously 30º F right now. dedication? stupidity? even though it’s freezing right now, this dress has me totally dreaming of spring! seems like there’s one more project… oh yeah, i’m outfitting that same sister’s wedding! 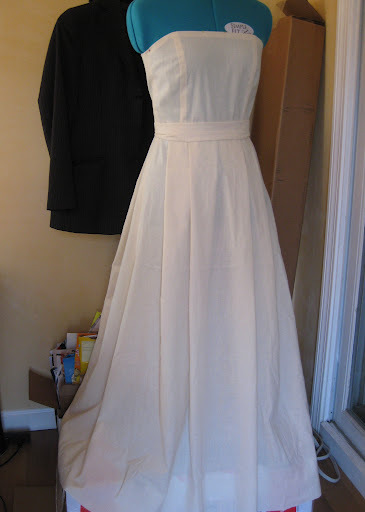 here’s a picture of the wedding dress muslin work in progress. there’s not much to show on this yet, i’m working out some cap sleeves, will have to adjust the bodice seam lines to match up with the pleats and figure out how to make a short train. i’ll definitely let you in on the project as i progress! i don’t know about you, but i am endlessly fascinated by the interior workings of gowns and such. 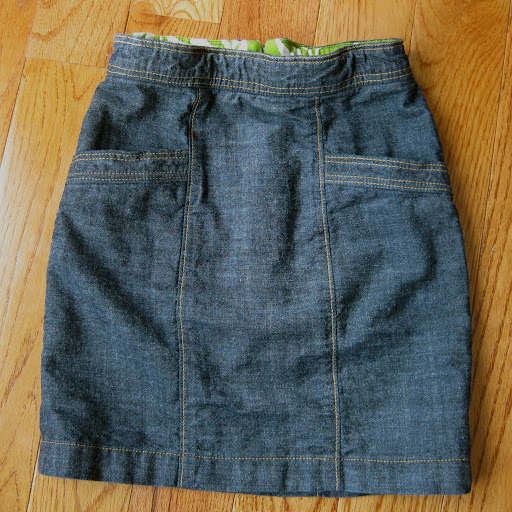 the denim skirt for my seven year old is finished! actually i finished a week ago, just didn’t have the opportunity to photograph it sooner. it’s such a confidence booster to design, draft and sew a project. oh yeah, and have it look good! 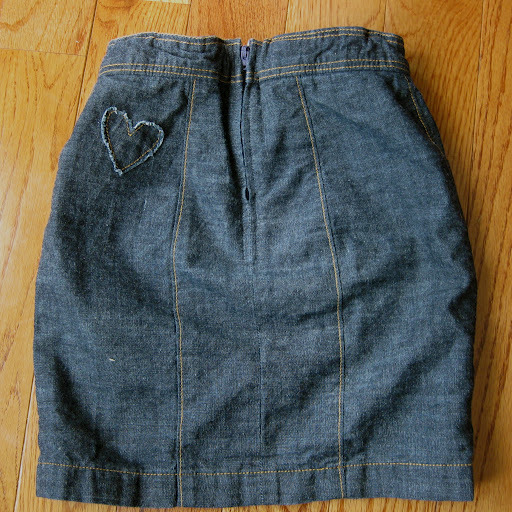 i added a simple straight waistband. originally i was going to make it 2″ wide, but settled on 1 1/2″. 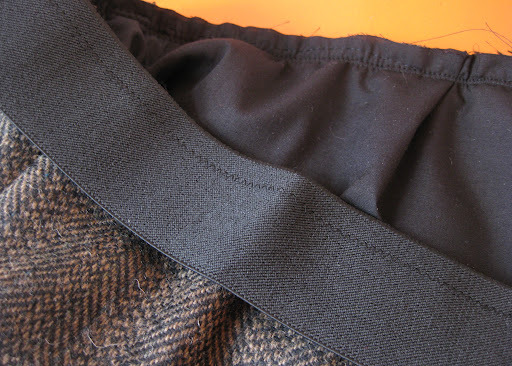 i used underlining to stabilize the waistband and used a thinner cotton material for the waistband facing. this cuts down on the bulk and gives me a chance to add a little color to the inside. which i love! 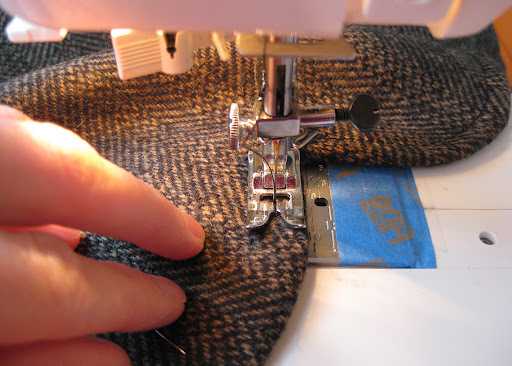 and of course, a little more topstitching. instead of using an invisible zip, i went with a standard zip. 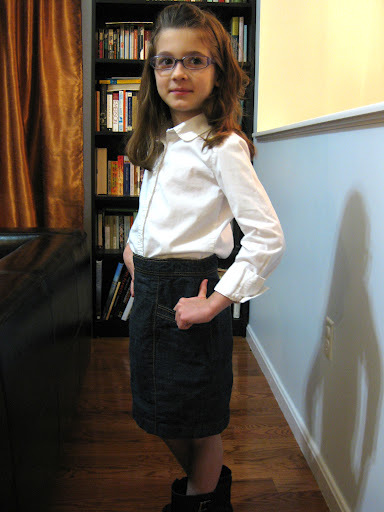 i find that the invisible zips get caught on bulkier seams and i don’t want my daughter to have to struggle to zip her own skirt. she’s the type that would just leave something half zipped if it requires too much effort. we’re working on that. with the zipper inserted, i added some elastic in the waistband to keep it comfortable for a kid. i stitched the elastic in place at each end, right next to the zipper. then i pulled the facing over and pinned it in place, then from the outside, stitched just under the waistband to catch the facing. in retrospect i probably should have stitched the facing in place along the lower edge first, then threaded the elastic. but… whatevs. this won’t be my last waist band. then to stabilize the top of the waistband i stitched just next to the lower row of topstitching. 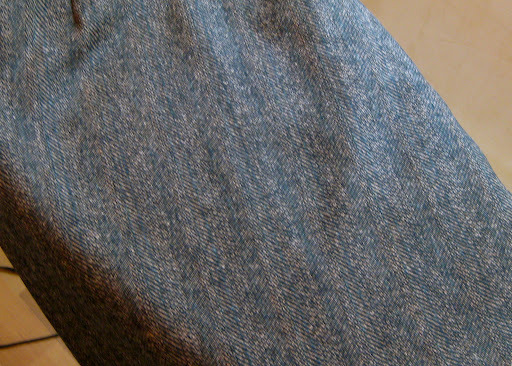 my dark thread disappears into the denim, so i was able to get a nice crisp top edge. 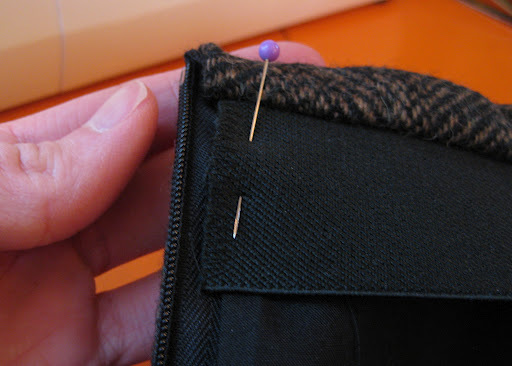 i hemmed and hawed about whether to stitch the hem in my topstitching gold thread or to hide it with navy thread. i ended up with the gold to give it a more casual look. so that’s that! as i finished up this skirt i kept thinking: ooh this looks just like something i would pick up in the kids section of j. crew and immediately scoff at the outrageous price! 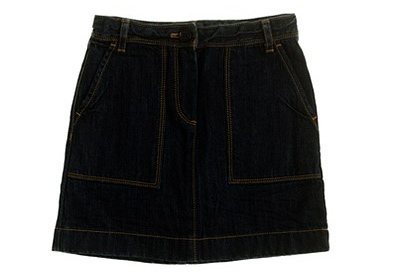 just to find out i took a look over at their website and found a jean skirt. cute, yes. but $55? considering that i made mine out of leftovers (the original fabric was on sale for about $6.50/yd)… again, why don’t more people sew? this little one adores her new skirt. her only complaint? the pockets aren’t big enough. 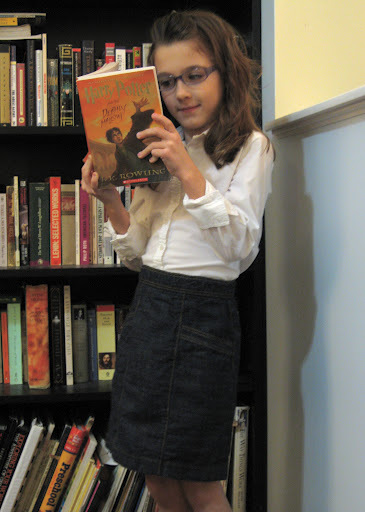 she was (and i quote) “hoping they would be big enough to put a book in.” considering her favorite book at the moment is any of the seven harry potter books, that indeed, would be a big pocket. sigh… just can’t win sometimes! 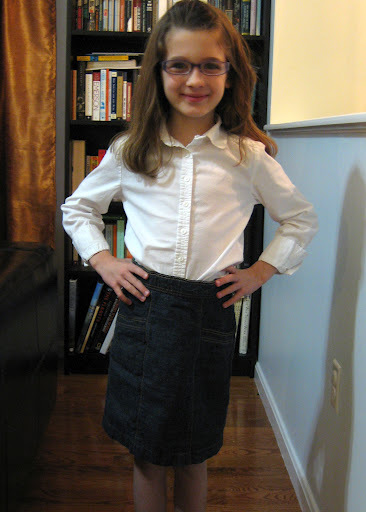 following the guidelines from the book “How to Make Your Own Sewing Patterns” by Donald H. McCunn, i’ve been working on a self-drafted skirt for my 7 year old daughter. after drafting the basic shape i added seams and slant front pockets and made up all my pattern pieces. i cut the denim and it all has sewn up beautifully! i have to say, i love this skirt. and i’m kind of addicted to topstitching. after i tried it on her, i decided to bring it in a touch at the hipline. the drafting instructions have essentially 4″ of ease in the hips. this amount is probably just fine for a curvy adult, but it looks a bit ridiculous on a thin 7 year old’s frame! it’s was an easy fix, i just stitched 1/4″ in from my original stitching line, taking out 1″ overall. 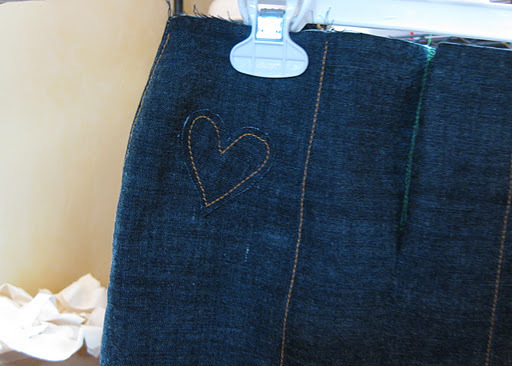 i decided to add a little whimsical touch to the back and sewed on a heart patch. 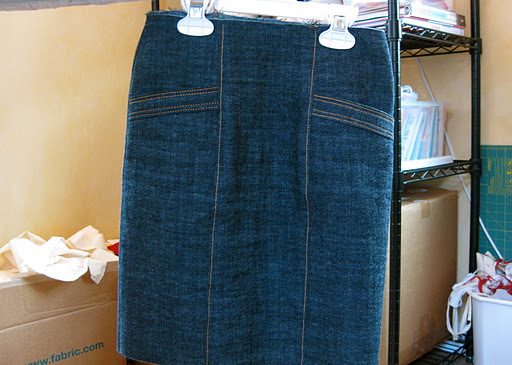 i left the edges raw so that when the skirt is washed the edges will fray a little. next i’ll cut and sew on the waistband, insert a back zip and add some elastic in the waistband. 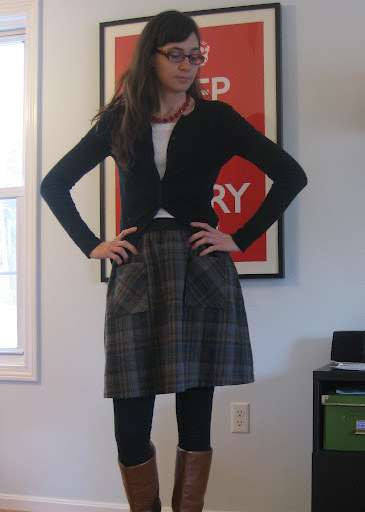 there’s not too much to say about this skirt, it’s all pretty straightforward. hopefully i’ll be back with the finished project soon!